Your business has outgrown its introductory software and you've determined that it's time to implement a more robust inventory management and accounting system. Now what? 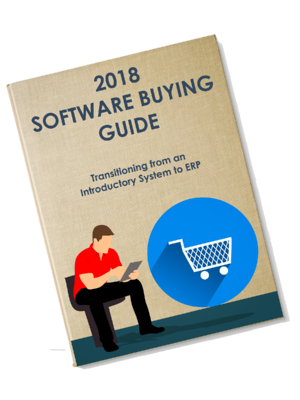 This Software Buying Guide examines a number of important factors to consider when replacing introductory software (such as QuickBooks) or an outdated legacy system, for all-in-one inventory management and accounting (ERP) solution . It will also help you address common software search pitfalls you may encounter along the way to ensure a smooth implementation. Information is broken down by functionality, integration, support and price range. The software search process and how to avoid typical stumbling blocks. Includes several overlooked steps to get you started such as setting priorities, which requirements to evaluate and how to make the final decision. A comprehensive comparison chart of implementation methods. Learn if your company is more suitable for a cloud-based or on-premises solution. How to compare different software vendors and addressing budget concerns. Includes information on what questions you should be asking and how to rank your options. Finding and implementing a new Inventory Management and Accounting System involves a large commitment of resources including money and time. It's important to understand the best approach for finding an appropriate solution, and doing your research on what systems are available in the market will help make sure you find the right system that best fits your company's unique needs. Simply fill out our quick form to access your FREE software buying guide. Download Your FREE Software Buying Guide! "Blue Link Elite has provided us with easy access to important business data via an extremely user-friendly interface. This has allowed us to make informed business decisions and has helped us manage our business effectively."